The Verdi Twin’s state-of-the-art features were designed for time saving efficiency, allowing operators to do more, and do it with perfection every time. The multi-roller design eliminates the awkwardness associated with handling large panels and prohibits smaller panels from slipping into roller gaps. The Verdi Cutter features a belt-driven mechanism which results in high speeds and can cut panels of up to 10′ in only seconds. The saw blade automatically returns to the upper position after a cut for operator safety and there is no need for manual adjustments. This dual saw and pneumatic cutting system requires no cutting head changes between materials. All the operator has to do is just push the button and cut. The 7/8″ cutting depth allows for the cutting of multiple boards at once and the versatile design means no cutting limitations. The Verdi Twin engine, mounted with linear bearings, eliminates the vibrations and movements associated with standard screw-drive saw cutters, which results in superior, accurate and clean cuts- especially with aluminum composites, and even acrylic. Precision mass production capabilities, the Verdi Twin’s cutting-edge design is the solution, helping you achieve the perfect cut the first time, every time. Perfectly executed projects produce not only happy customers, but also greater profitability, higher product quality and higher profit margins! 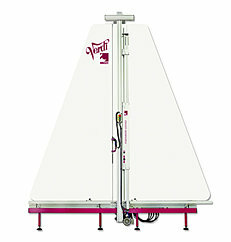 If you have any questions or are interested in purchasing the Keencut Verdi Cutter, visit us at SpiralBinding.com. We have great pricing on a full line of Board Trimmers. Call us at 1-800-631-3572 for more information!